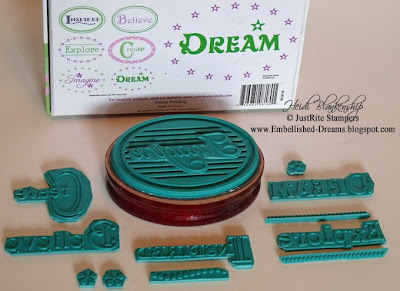 Before I get started with the project for toady I have to tell you about some Fabulous Blog Candy from JustRite Stampers! 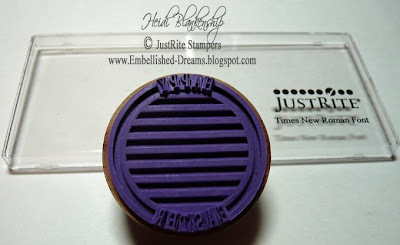 JustRite Stampers is celebrating hitting 250,000 hits on their blog this week!!! WOW--A Huge Congrats to JustRite Stampers!!! 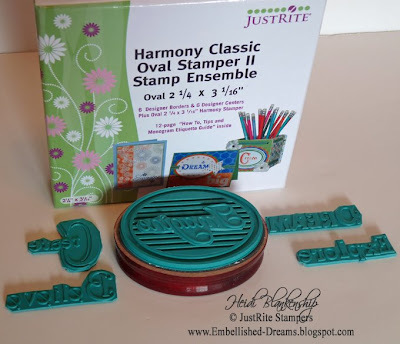 JustRite Stampers is giving away over $75.00 in products!! And if that wasn't enough for every 250 people who leave a comment they will add an Additional Prize Package!!! You still have time to leave your comment and tell all of your friends about it! You have until Friday night at Midnight--*EST to enter. 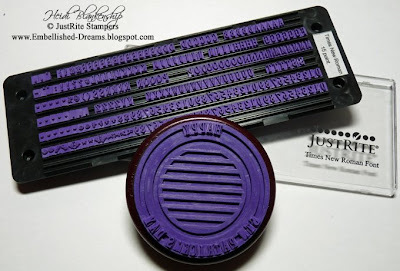 Click HERE to go the the JustRite Stampers Blog and leave a comment. Today I have a really fun project to share with you. I first came across this sweet little candy shaker treat on the Terri O. Crafters Forum. 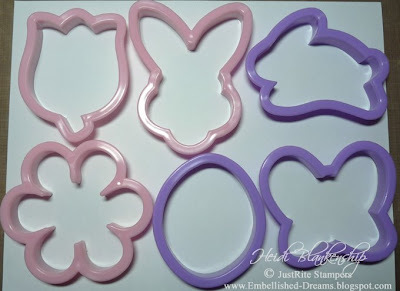 One of the supplies for making the shaker is plastic cookie cutters and a few days ago when I was shopping I found these great pastel spring shaped cookie cutters. As soon as I spotted them I remembered seeing a wonderful video tutorial that Terri O. had posted on the Terri O. Crafters Forum and I knew I had to give them a try! 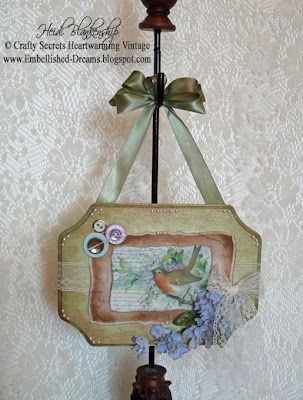 Click HERE if you would like to see the video tutorial by Terri O. After I came home I watched the video again and to my disappointment I discovered that the cookie cutters I had purchased were not the same style and they weren't going to work the same. The cookie cutters that Terri O. used in the video had a lip or groove on the inside to hold the plastic in place and the ones I have don't have that. But they were so cute and springy and I wanted to use them so I came up with a different little spin on the cookie cutter shakers and it worked! Gotta love that! So I'm going to share my tutorial with all of you but please be sure to check out the video tutorial by Terri O. Here is a picture of the Cookie Cutter Shaker treat once it is finished. How cute is that? I think these would make great little holiday gifts and now you can find almost any kind of cookie cutter shape you would ever want so you could make them for any occasion. Here's the pretty spring cookie cutters that I purchased. Ok, let's get started! 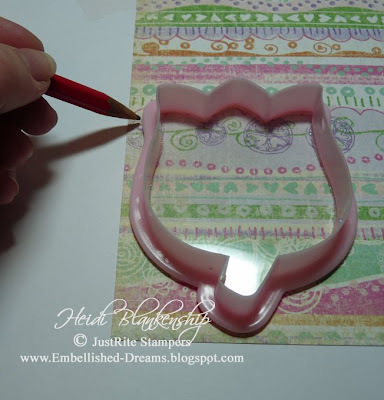 The fist thing that you will need to do is trace the shape of the cookie cutter on a piece of acetate (or if you are going GREEN then you can use some clear plastic from packaging or a plate or something similar). 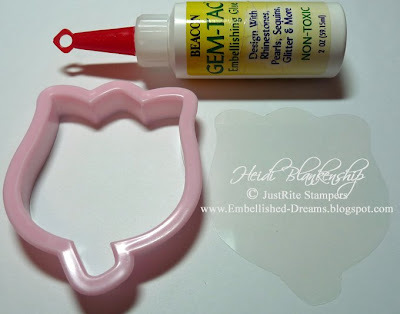 Cut out the shape and then apply Beacon Gem-Tac adhesive on the edges of the acetate and place the acetate on top of the cookie cutter. Once you have this done let it sit for a few minutes so the adhesive starts to set. 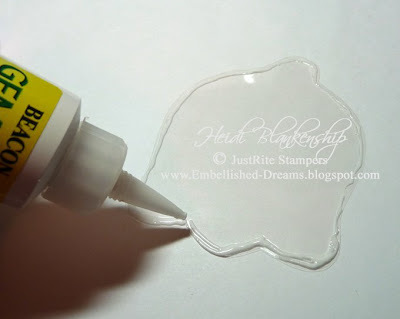 Then apply more of the Gem-Tac to the top of the acetate on the cookie cutter going all the way around the edges. Apply glitter and set aside to dry. By applying the glitter to the top this will cover up the edge of the acetate and give it a more finished look. After the adhesive is completely dry then I punched a hole in the side of the cookie cutter using my Crop-A-Dile. I took a piece of pink ribbon and made a loop with a knot on one edge and threaded it through the hole in the cookie cutter. Next I took a piece of pretty Spring colored designer paper from Crate Paper the Katlin Collection, Notebook and traced around the cookie cutter. Then I cut out the flower shape a little larger and made little cuts into the paper going all the way around the edges. I put the cookie cutter with the acetate face down and filled the inside with some candy. Then I took a tape runner and went all the way around the edges of the designer paper and placed the paper on top of the cookie cutter. I went around all of the edges pressing the paper down on the sides of the cookie cutter. Once I had all of the little paper tabs pressed down on the cookie cutter then I took a piece of pink ribbon and ran it through the Xyron and then went around the edges of the cookie cutter with the ribbon to cover up the paper tabs and give it a cleaner look. That's all there is to it! 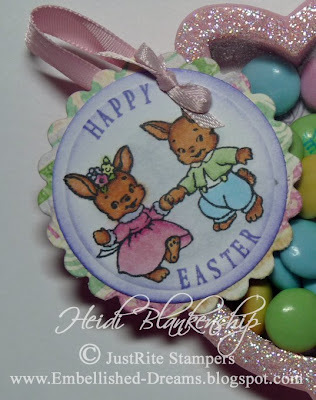 I thought it was really cute but it still needed a little something so I made an Easter tag to match. 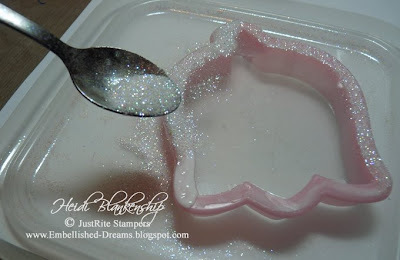 I hope you enjoyed the Cookie Cutter Candy Shaker Tutorial. 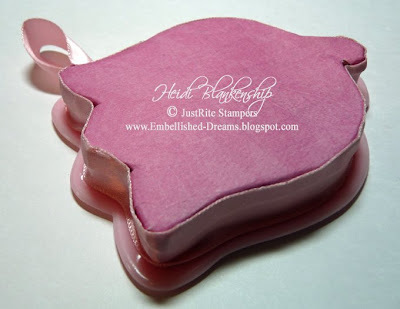 Thank you so much for stopping by today and don't forget to visit the JustRite Stampers Blog for a chance to win some yummy blog candy!! Here we are at week # 4 of the March Mix with Crafty Secrets and Tattered Angels. I really hope you have enjoyed all of the wonderful projects and have been inspired to try some of the Crafty Secrets and/or Tattered Angels products. Here is a list of the Design Team Members who have projects to share with you today. I know they will have some wonderful and inspiring projects to share with you so be sure to visit each one. I know you won't want to miss out! Also here is a list of ALL of the Design Team Members from Crafty Secrets and Tattered Angels. Some of them might also have some projects to share with you today so be sure to also check them out! Today I have another Easter card to share with you. 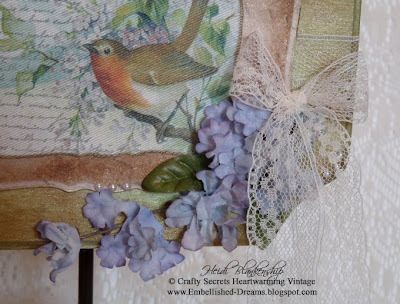 For the focal point I used one of the beautiful images from the NEW Crafty Secrets Easter Creative Scraps. You are going to love these!! The images are absolutely amazing!! 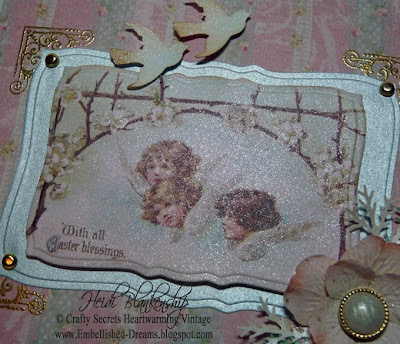 I used the Curved Rectangles S5-006 die template from Spellbinders to cut out the image of the angels and flowers from the Easter Creative Scraps. Then I used the next larger size of the same die template to cut out a mat of Petallics Juniper Berry from WorldWin to create a mat behind the image. 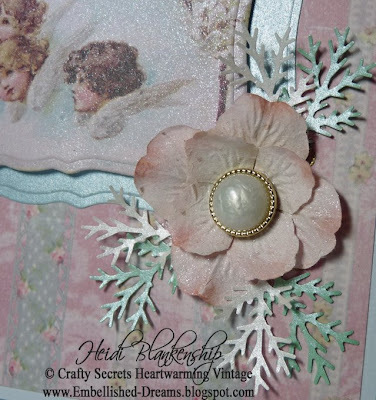 I used two different colors of Glimmer Mist, Pearl and Snow Angel from Tattered Angels on the angel image. The Snow Angel Glimmer Mist is a very light pink with a pearl shimmer. While the image was drying then I punched out two birds using a Martha Stewart punch. I used the Copic Airbrush System and Sketch Marker B00 Frost Blue to lightly airbrush a little blue on the birds. 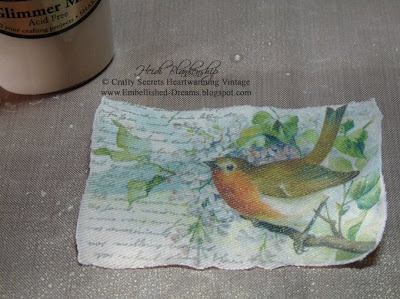 Then I took a cotton ball with Distress Ink Vintage Photo and added a little ink to the edges and then I misted them with Pearl Glimmer Mist. Next I inked the Prima Hydrangea flowers with Snow Cap, Ranger Adirondack Ink and a cotton ball. 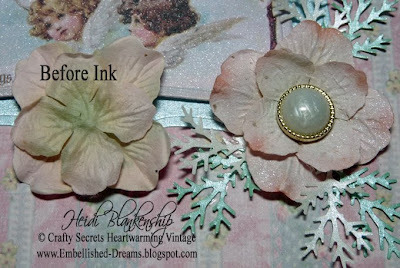 Then I added just a tiny bit of Really Rust ink from Stampin' Up to the edges of the petals using a q-tip and then I went back over the flowers with the Snow Cap ink to soften up the Really Rust color. After the ink was dry then I misted the flowers with Pearl Glimmer Mist. When the flower petals were all dry then I put the flower together using glue dot and I added a pearl and gold button the to center. I also punched out some "fern leaves" from Petallics Spring Larch and Beargrass cardstock from WorldWin using the Martha Stewart Twig Punch and added them behind the flower. Here is a picture showing the before and after of the flower. 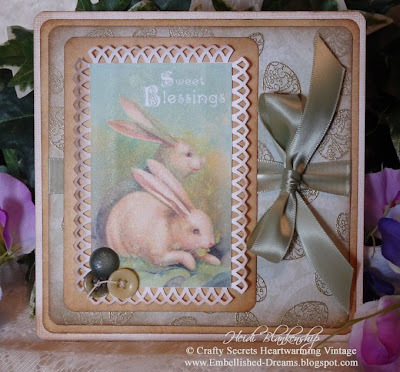 For the beautiful gold filigree corners I used the corner stamp from Crafty Secrets Serenity Prayer Stamp Set. I stamped the images using gold pigment ink and then embossed them with gold EP. I also added some gold brads in the corners of the diecut and a few pearls in the corners of the card. 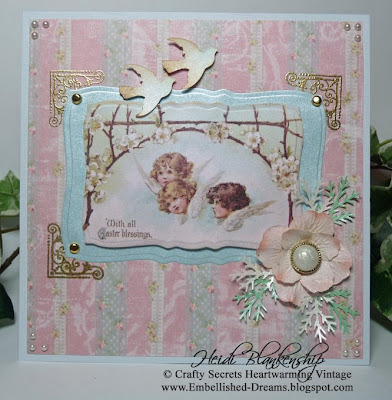 The background paper is from Crafty Secrets Pastel Designer Paper Pad. Dont' forget to check out both the Crafty Secrets and the Tattered Angels websites to find all of these amazing products and see all of the beautiful design work by the Design Team Members. Also be sure to stop by both of the blogs--both Crafty Secrets and Tattered Angels are giving away some Fabulous Blog Candy!! Thank you so much for stopping by today and I hope you make it a good one!! I have a craft room in our basement but recently I have been working on another creative space of my own on the main level of our home. It gets pretty darn cold here in Minnesota in the winter time and I have found myself doing more crafts upstairs instead of in my craft room so I decided to create another space that would be a little warmer and not in the middle of the kitchen-lol! Actually my mom had the idea to take a wall in our dining room (it's a really big room) and turn that into my space. I have a library table that is in the center and then I am going to be getting two shelving units to go on each side of the table. I have already found decorative boxes and matching baskets to hold a lot of the stuff, but it's still a work in progress. I also have some other shelves that I am going to used to display some of my work and also cards from friends. I want the space to be functional but also decorative since it is on the main level of the house. I was trying to think of something I could make to hang above my work space that would be pretty and inspirational and I came up with the idea to make a word banner. This is the first time I have ever made a banner. I used several of my favorite products and I had a lot of fun creating it. 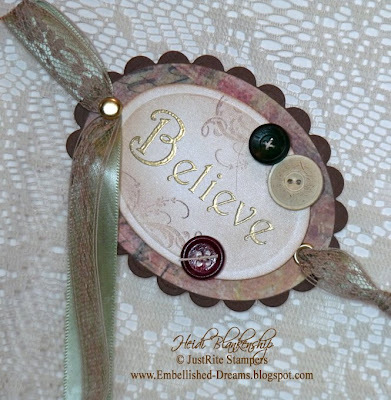 All of the inspirational words are from the Harmony Classic Oval Stamper II Stamp Ensemble (Oval 2-1/4 x 3-1/16'') from JustRite Stampers. 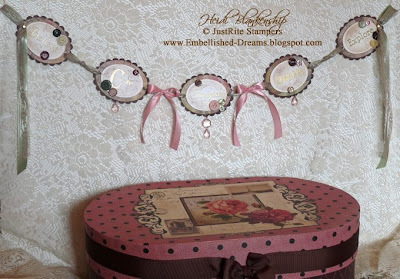 This set includes 6 Designer Borders & 6 Designer Centers Plus the Oval Stamper. I know I have mentioned in other posts but for those of you who might have missed them, you can trim the extra rubber off of your JustRite stamps. Here is a picture showing you how I have trimmed mine. Also if there is enough space in between images and words you can carefully cut them apart too. This will give you many more possibilities of combinations for your stamps. 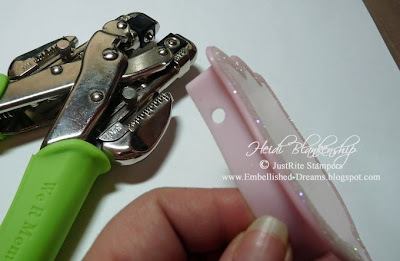 Below is a picture of how you can trim your stamps. By doing the trimming on this set I have taken 6 centers and turned that into 12 individual stamps. Now because the grooves are what hold the stamps onto the block you have to be careful when you are trimming the stamps! The great thing about the JustRite stamps is that once you trim them because of the grooves you can still use them as pictured on the box or you can change them up. All of the words were stamped onto Cryogen White cardstock with gold pigment ink and then embossed with gold EP. The designer paper is Flora Bella from Cosmo Cricket and the Coffee Brown cardstock is from WolrdWin. To make the diecuts I used the Wizard, Classic Oval Lg. S4-110, Classic Scalloped Oval Lg. S4-111 die templates from Spellbinders. After I made all of the diecuts from the Cryogen White cardstock then I popped each of the diecuts back into the die template and then used a cotton ball with Vintage Photo ink from Ranger to lightly stencil the inside. I also inked the edges of the diecuts with the same ink. There was still a lot of open space on the ovals and I wanted to add a little something but I wanted to be careful not to take away from the words. Using the same Vintage Photo ink I added flourishes around the edges. 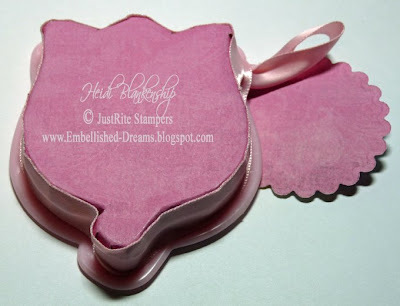 The flourish stamp is from the Flourishes stamp set from Crafty Secrets. I wanted to add a little dimension so I used foam tape under the diecuts with the words. Then I added eyelets to each side and put ribbon and lace trim to connect all of the ovals. After the ovals were all connected then I added some pretty antique buttons and a couple of rose colored bows towards the center. The ribbon I used for the bows was a very light pink and I wanted to darken it up a bit so I misted the bows with Vintage Pink and Old Lace Glimmer Mist from Tattered Angels. To finish of the banner I added a few Pink Chandelier Crystals from Heidi Swapp. Here are several close up pictures of each word going from Left to Right. This is the center one. Here is another picture of the finished banner along with one of the decorative boxes that I am going to be using for storage in my new creative space. I am very happy with how the banner turned out and I can't wait to hang it up. Thank you so much for stopping by and I hope you are having a Fantastic Week! 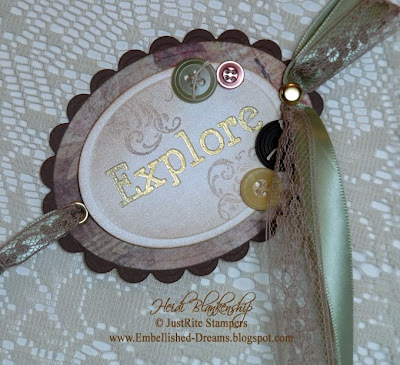 Please be sure to check out the JustRite Stampers Gallery and Blog to see some wonderful creations. JustRite Happy St. Patrick's Day! Hello and Happy St. Patrick's Day to you all!! 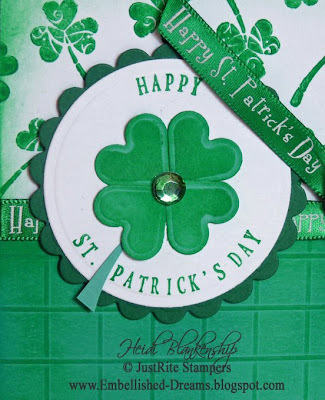 I have a cute St. Patrick's Day Card to share with you today. For the sentiment I used the NEW 2'' Wood Stamper with the 15 pt. Font Set from JustRite Stampers. I wanted to use this wood stamper because it allowed enough space in between for the little shamrock. 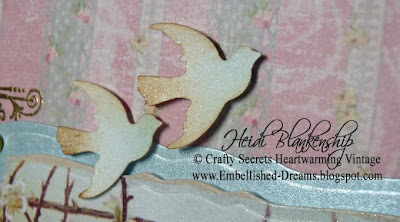 (Coming Soon--I will be sharing some other projects made with the 2'' Wood Stamper. 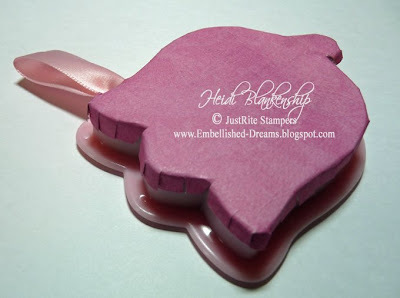 You are going to love this stamper!! It has a double groove border for endless possibilities!) I only used one color if ink on the entire card, Clover Adirondack Ink from Ranger. After I stamped the sentiment then I made two diecuts using the Standard Circles Lg. S4-114 and Classic Scalloped Circles Lg. die templates from Spellbinders. I made the shamrock using a die template from the Classic Heart S4-136 die templates from Spellbinders and I added a green rhinestone to the center. For the background I stamped the clover image from Inkadinkado, Holiday Seasons Set and then inked the edges. On the green cardstock I made the score lines using a Scor-Pal and then inked over the entire piece. I also added some Happy St. Patrick's Day ribbon. Other~Spellbinders-Wizard, Standard Circles LG S4-114, Classic Scalloped Circles LG S4-124, Classic Heart S4-136 Die Templates, Scor-Pal, Printed Ribbon, Rhinestones, Foam Tape and Cotton Balls. 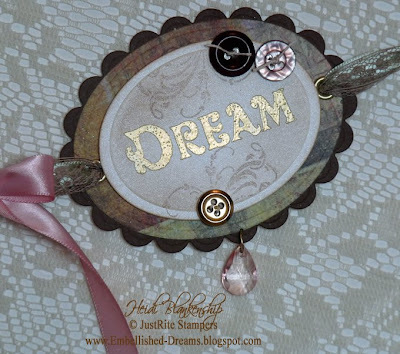 Don't forget to check out the JustRite Stampers Gallery and Blog, they are filled with lots and lots of inspiration! 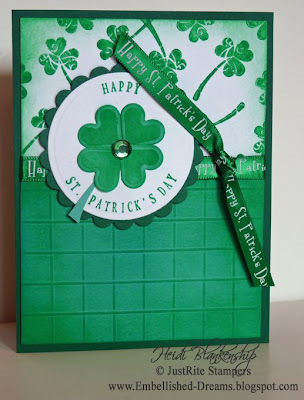 The JustRite Stampers Blog has a really cute St. Patrick's Day card today and you can also check out the NEW Stamp Set, Favorite Occasions. One more must see project is this adorable St. Patrick's Day Chinese Takeout Box by Kellie Fortin, click HERE to check it out! Be sure to stop back soon, I am going to be posting a Inspiration Word Banner (using more wonderful JustRite products!) a little later tonight (might not be until the kids are in bed *wink*) Thanks so much for stopping by today & I hope you have a Happy St. Patrick's Day!! 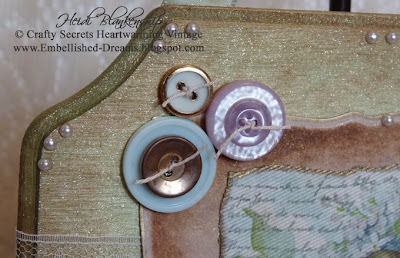 Wow, I can't believe we are already on week # 3 of the Crafty Secrets and Tattered Angels March Mix! If this is your first time visiting I'm sure you are wondering what the March Mix is all about. The March Mix is all about two Fantastic Companies, Crafty Secrets and Tattered Angels mixing it up for a month--what this means is that the Design Team Members from both companies are using the products manufactured by each company and creating some amazing works of art to share with all of you for the month of March. If you missed the first two weeks click HERE for week one and click HERE for week two. Here is a list of the Design Team Members who have projects to share with you today. I know they will have some wonderful and inspiring projects to share with you so be sure to visit each one. I know you won't want to miss out! 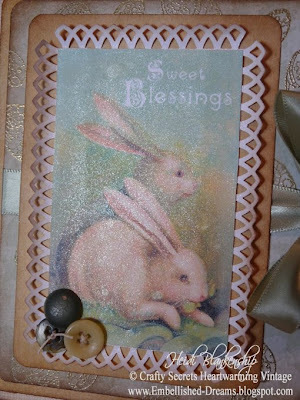 I have an Easter card to share with you today and I used the NEW Easter Creative Scraps for the image. Wait until you see all of these beautiful images in person!! They are so pretty and each image has so much detail. 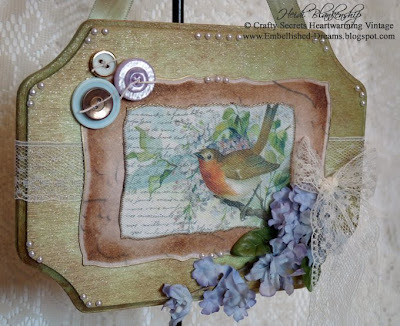 If you haven't seen the NEW Creative Scraps from Crafty Secrets click HERE for a link to the Heartwarming Vintage Blog to see all of the beautiful designs. I think the image of the little bunnies is so adorable! I started with the image of the bunnies and inked the edges with Snowcap ink from Ranger to soften up the edges. Then I misted it with Pearl Glimmer Mist from Tattered Angles. Here is a close-up picture of the bunnies and you can see the shimmer on the paper from the Glimmer Mist. I used a Martha Stewart Border Punch to make a frame around the image and then I inked the border with Vintage Photo Ink from Ranger. 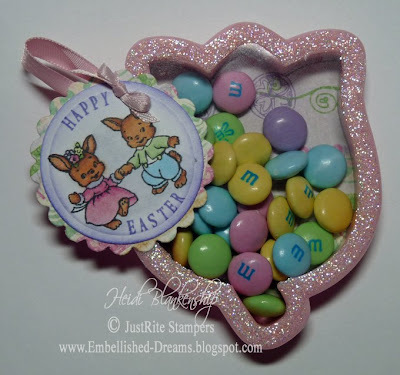 The Easter eggs are stamps from the NEW Easter Joy stamp set from Crafty Secrets. I used a gold pigment ink and then embossed them with gold EP. 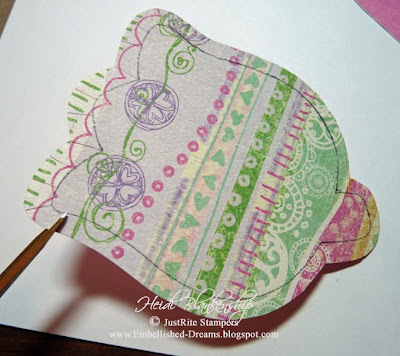 The light green and golden yellow designer paper are from the Crafty Secrets Pastel Paper Pad. I inked the edges of all the CS using Vintage Photo ink from Ranger. Then for a finishing touch I added some beautiful light green ribbon. 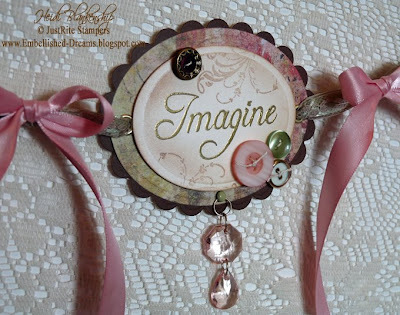 This ribbon is one of my personal favorites! I also added a few antique buttons in the corner. The buttons were a recent find at one of the local antique shops. If you would like to find out more about the Crafty Secrets and Tattered Angels products and see more inspiring art work from the Design Team Members be sure to check out the Websites and Blogs listed below. Hello and Happy Saturday! It looks like it's going to be a Beautiful day here in MN, the sky is blue, the sun is out and it's going to be in the high 40's! Come on Spring!! So what to do you think of the New Look? I made the banner from a picture I had taken at the butterfly garden. I'm still not sure about the colors?? I tried several colors for the title and even though I'm not a huge fan of yellow it looked the best out of all the colors. So I also decided to try a really pale yellow for the background. I think I'm going to let it be for a few days and see how I like it. It might still change, who knows. I wanted to get away from the black and go with something new and fresh for spring but also to have something that is easy on the eyes. So let me know what you think. Thanks for stopping by and I hope you have a Terrific day!! 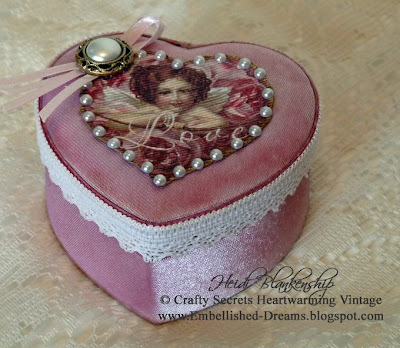 Today is the second week of the Crafty Secrets and Tattered Angels March Mix! Here is a list of Design Team Members who are featuring designs made with products from both manufactures. Also if you would like to check out the blogs of the other Design team Members from Crafty Secrets and Tattered Angels here is a list of there blogs too! I have a really quick and easy little project to share with you today using Cotton Scraps from Crafty Secrets and Glimmer Mist from Tattered Angels. I was at Joann's about a week ago and found these cute little satin heart shaped boxes for .25 cents each! Here is a picture of the box and the Cotton Scraps before I altered it. 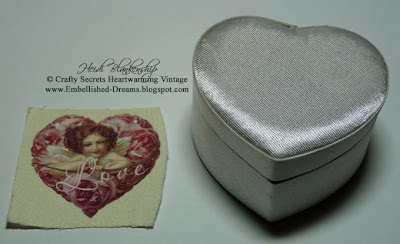 The image is from the Romance Cotton Scraps from Crafty Secrets. 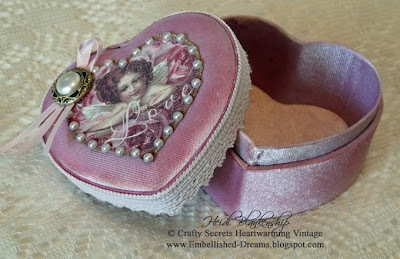 To start out I covered the entire box with Vintage Pink Glimmer Mist from Tattered Angels. I also wanted to add a little darker color around the top but I didn't want the color to be too intense so I used a cotton ball to apply the Red Velvet Glimmer Mist. 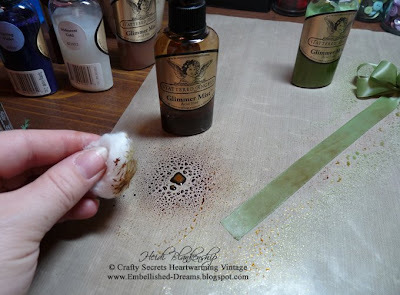 While I was waiting for the box to dry I cut out the piece from the Cotton Scraps and then I carefully edged it with a gold leafing pen from Krylon and misted it with Iridescent Gold Glimmer Mist. Once everything was dry then I applied the Cotton Scraps to the top using Fabri-Tac from Beacon. Then I added some lace trim around the edges, tiny pearls, ribbon and a button. Here is a view of the inside. I hope you enjoyed this quick and easy little project today. Don't forget to stop by the Crafty Secrets Website and take a look at the gallery and also the Crafty Secrets Blog and the Tattered Angels Website and Blog. Hello! I just wanted to let you all know that today is my day for the Spellbinders Designer Spotlight. Spellbinders has been doing the Designer Spotlights on the Spellbinders Blog so that people can get to know the designers a little better. Each of the designers is given a list of questions and then we get to look through the list and pick out a few we would like to answer. I have really enjoyed reading the answers from the other designers that have already been in the spotlight! Also a few of the designer's favorite art pieces are featured in the spotlight. 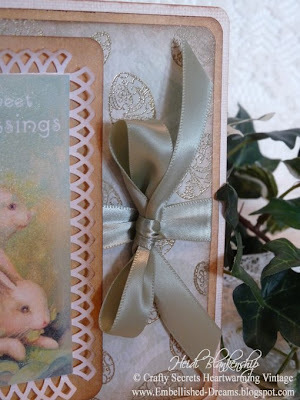 If you would like to check out my Spellbinders Designer Spotlight click HERE and if you would like to read about the other designers who have already been in the Spotlight click HERE. Thanks so much for stopping by today! Hope you have a Terrific Day!! Today is the beginning of the first week for the Crafty Secrets Heartwarming Vintage and Tattered Angels, makers of Glimmer Mist March Mix. You might be asking yourself what is the March Mix? The Design Team Members from Crafty Secrets and Tattered Angels are teaming up for the month of March!! How exciting is that!! The Design Team Members will be using the Fantastic products from both manufactures to create their designs. The products work so fabulous together so this should be a lot of fun to see what each Design Team Member comes up with! So are you ready to get started with the march Mix? 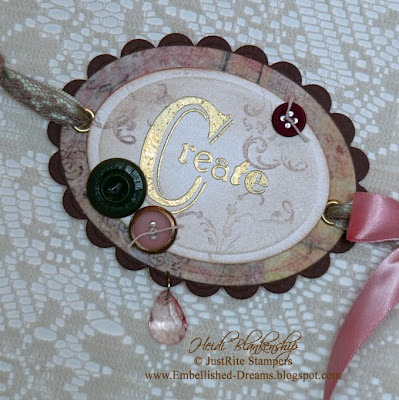 Here is a list of the Design Team Members from Crafty Secrets and Tattered Angels that have some beautiful creations to share with you today. Be sure to stop by each one! Thank you so much for stopping by today and don't forget to check out the other Design Team Members (listed above), I'm sure they have some Beautiful Creations to share with all of you! Also don't for get to check out Crafty Secrets Heartwarming Vintage and the Crafty Secrets Blog and the Tattered Angels Website and Blog! I know you will find many wonderful and inspiring projects! !